Michael Tomasky introduces Issue #18. A year later, in Issue #5, they published Elizabeth Warren’s “Unsafe at Any Rate,” the article in which she first proposed an idea for a federal agency to regulate and protect consumer financial instruments. And now, just three years after that, I am here to tell you that Warren’s idea is the law of the land. And not just any law; the Bureau of Consumer Financial Protection is arguably the centerpiece of the largest financial regulatory reform legislation to pass Congress in decades. It’s not often that an idea goes from the pages of a small-circulation journal to the statute books that quickly. It’s testament to the fact that it was a good idea, and to Warren’s dogged follow-through. But it also confirms that Ken and Andrei were right. Ideas matter. Our bet is paying off: for the sake of establishing Democracy as a journal of genuine influence in a remarkably short period of time, and more importantly, for having put forth an idea that will help millions of consumers and improve progressive governance. That’s what we’re here for. Obviously, not every article we publish is going to produce federal legislation, but with every issue, we accumulate evidence that what we’re doing matters. My essay from the last issue, “Against Despair,” generated heaps of praise and criticism in the mainstream media and the blogosphere, and helped spark a much-needed conversation on how progressives should regard the disappointments of the Obama era (we invited one of the piece’s critics, David Dayen of the progressive blog Firedoglake, to write a response). And with the issue you’re holding now, we know we’ve published some pieces that will be talked about both today and in the future. Ever since the health-care reform bill passed, we have wanted to run an article that would take a hard look at how the new law might work, and not work, as its provisions took hold. “Health-Care Reform, 2015” is the product of that notion. To write it, we enlisted Jacob S. Hacker of Yale: the father of the public-option idea and arguably the leading progressive academic expert on health policy in the country. Hacker looks ahead to five years from now, one year into full implementation of the law (we assume for the purposes of this piece that it has not been repealed), and explains what will be working, what won’t be, what the next health-care debate will entail, and how progressives can position themselves to win those next battles. It’s a great and very important piece that I have no doubt will be read closely by decision-makers now and five years hence. Progressives and others thinking about the deficit and entitlements will want to read the stimulating debate between Isabel Sawhill and Greg Anrig. Whether we should be open to manageable cuts in Social Security and Medicare now to avoid drastic ones later, as Sawhill believes, or should resist such stratagems as the first steps in the shredding of the social safety net (Anrig’s view) is a disagreement that sharply divides progressives. We felt it was important to represent both views, and we found worthy combatants to do so. If you are worried about Europe but at a loss as to what the European Union needs to do to sort itself out, then read Henry Farrell: You’ll be at a loss no longer. And finally, moving us out of the policy realm and into the kingdom of philosophy, Roger Berkowitz of Bard College offers a provocative rumination on why we so often refuse these days to pass judgment on wrongdoers, on liberalism’s culpability in this state of affairs, and on the price we pay for failing to do so. The book reviews are stellar entries from four marvelous writers. Michelle Goldberg wanted to be sympathetic to Ayaan Hirsi Ali, but certain things kept getting in the way. Ray Suarez offers an eloquent reflection on whiteness throughout American history. Martin Kettle was at Oxford with Christopher Hitchens and knows both the commendable and the less so better than most. And Jim Sleeper argues that military historian Victor Davis Hanson has been preaching the wrong lessons from the ancients. It’s a pretty wide-ranging feast to which Ken and Andrei’s words from the first issue still apply. 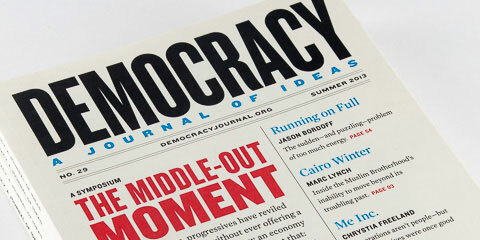 Michael Tomasky is the editor of Democracy: A Journal of Ideas and a special correspondent for The Daily Beast.